Chris Pile - Goalkeeper makes history - LFChistory - Stats galore for Liverpool FC! Chris Pile could have been a more familiar name among the Liverpool faithful, had it not been for injuries which curtailed his Anfield career. He was the youngest player ever to be involved in a European cup final when he had just turned 18. Pile was close to getting his breakthrough into the first team fold, when picking up an injury which meant Mike Hooper was bought and became 2nd choice. Lfchistory has been in contact with Pile who is now living in New Zealand. Chris Pile told us his story. Coming from Liverpool, being a Liverpool fan, watching from The Kop as a kid, to come out and be part of the team, money could not buy that. Straight away things changed, training with the first team trying to save every shot from Rushie, Kenny etc., then on Saturday hoping every shot they make goes in. Bob Bolder broke his leg playing in the 2nd team with about a month to go of the 1984-85 season so I was told by boss Joe Fagan I would be in the squad for Heysel there and then. As a fan it was going to be a dream come true. The chance to see Liverpool win the European Cup Final for a fifth time and get a gold winners’ medal. Something a lot of the great goalkeepers never got close to and I was only 18. I think at the time I was the youngest ever to be involved in a European Cup Final, that still might be today. I was 18 years, 1 month and 25 days. I can recall as if it were yesterday our changing room was at the end were the trouble was. We could hear that there was trouble from some of the players who were warming up, then BANG a large sound of the wall falling. You could hear it right around the dressing room, then the rumours started.. 10, 20, 40, 60 died. All this before what was meant to be the greatest sporting day of your life. I remember sitting in the dressing room with Ronnie Moran and Roy Evans trying to keep spirits up but the damage had been done. The players went out and tried their best, but whatever happened we would have never won. In my four seasons there we won the European Cup, League Championships, the FA Cup and League Cups. The club was a family club. We all won together and lost together. There were no super stars, they were just ' the lads'. When I started at Liverpool I was fifth in line. Bob Wardle retired due to injury which took me up a place. Then Billy Stewart left, so there was Bruce, Bob Bolder and myself at the time I signed on my 17th birthday for 3 years. Joe Fagan was great with the youth team and said ‘Son you have the chance to be the next Ray Clemence’. You can imagine how great that would make you feel. After Heysel Bob wanted 1st team football and left to play for Charlton leaving Bruce and myself with a kid playing in the A team. Things were going well until I got injured in training. A simple injury of my studs getting caught up in the grass and I slipped a disc putting me out for two months, in which the club went out and signed Mike Hooper within days. I served out the rest of my contract but although I played a few 2nd team games Mike never got injured. 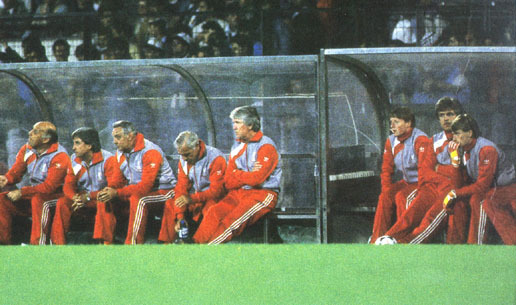 Pile on the bench (far right) vs. Juventus at Heysel. When I left LFC I spent time at Tranmere Rovers when Frank Worthington was manager. I played as a non-contract player in the 2nd team for about 6 months. They could not offer me anything so I moved to Bury were Martin Dobson was in charge. 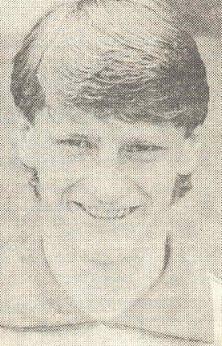 In October 1987 I was offered a contract but on the morning of signing I broke my wrist for the 2nd time. An injury I had at Liverpool about 18 months earlier. In February 1988 I got a call from an agent looking for overseas players to Australia and New Zealand. The chances of getting a contract at this time of the season were slim so I thought 6 months playing anywhere would do, so I went to New Zealand on 1st April 1988, were I to be a fool or not. I played for a team in Wellington called Waterside-Karori. After a few weeks there was a story from Scotland that Celtic wanted to talk but I was happy down under. We won the league in my 1st season. After playing in New Zealand for a year or two circumstances lead me to have to go back to UK and I ended up at Southport under Brian Kettle. Things went well until I broke my hand for the third time. This time a specialist told me to look for another career so I came back to New Zealand in 1992 and made the move a permanent one. I was sponsored by Mitsubishi Motors to play in my early days in New Zealand and was offered full time employment on my return. I get back to the UK as often as I can. I was home in August 2003 to see the opening game of the season against Chelsea. Now I work for New Zealand Soccer coaching under 15-20s. Also a friend of mine Ken Cresswell, who played for NZ in the 1982 World Cup in Spain, and I run the Umbro soccer academy in Wellington. I pass on all the good work I was taught from Bruce, Bob and the coaching staff at Liverpool.